Claim Jumper Townhouse 5 is a beautiful townhome that has everything your family could want. With a location close to most of Red River's attractions guests can walk almost anywhere. You don't even need to walk far to get to fishing spots loved by all who frequent Red River. Step out your front door and fish at the town's public ponds or step out the back and fish right on the river. 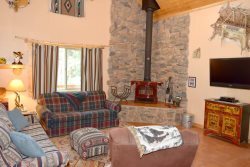 The living room is nice and open with a gas log fireplace for you to enjoy while you relax on vacation. The flat screen TV will give you the options of watching cable TV or movies brought from home. Claim Jumper Townhouse 5 has a large open kitchen that has plenty of counter space for several cooks! Going up the stairs you will find yourself looking to the two bedrooms. The master bedroom is equipped with a king bed, private balcony that overlooks the town ponds and Ski Area, a private full bathroom and closet space. To the other side of the hallway is the guest bedroom. This room has a queen bed, twin bunk bed, private bathroom, closet space, and a small flat screen TV. These bedrooms are both spacious to make sure that everyone in your party in comfortable! Claim Jumper Townhouse 5 offers guests amenities such as New Fiber Optic High Speed Internet to use during the duration of their stay. There is also a gas BBQ grill located on the back patio where families can relax in the shade and listen to the river rush on by! Two story townhome that has the river out back and the town ponds out the front foor. One king bed, one queen bed, a twin bunk bed, and a queen sleeper sofa in the living room. Living room includes a flat screen TV, a DVD player, a gas log fireplace, and family games. Claim Jumper Townhouse 5 provides cable, High Speed Internet, and a gas BBQ grill. Back patio that faces the river, with seating and table. Claim Jumper Townhouse 5 pet policy: Sorry no pets! The team was amazing! Always helpful and ready to answer any questions we had. The townhouse was comfortable, well-maintained, spacious and within walking distance to everything! A great place to stay and we will definitely go back! The team was very friendly and welcoming. Loved the townhouse! We would stay there again.